Synopsis: When a struggling lawyer is tasked with organizing and sort through a widow's legal papers in a remote mansion, he starts to see things that have citizens from the surrounding area terrified. This is a big movie for Daniel Radcliffe. He could potentially be stuck as being called Harry Potter for the rest of his life. I think he has definitely tried the hardest out of the Potter trio to make sure that doesn't stick. Rupert Grint is off being a goofy looking dude, and Emma Watson does have an upcoming movie, THE BENEFITS OF BEING A WALLFLOWER, that was shown in Sundance. Radcliffe in the meanwhile, I think was naked with horses on Broadway or something like that. Now he stars in THE WOMAN IN BLACK, a remake from the original 1989 TV movie. As I watched it, I had to detach myself a little bit from the notion that he's not Harry Potter but just a lawyer. Overall, it is a perfectly fine PG-13 horror movie. There was a lot of interesting atmosphere, and some legitimate jump scares that happen that made much of my audience scream and subsequently nervously laugh. When I left the theater, I was a bit on the fence as to how I felt, but I ended up liking it more and more as the days wore on. Daniel Radcliffe's performance works really well for the role. His character, Arthur Kipp, is a grieving widower and a struggling father that just wants to provide for his son working in a law firm. The transition to thinking about him as a father was a bit weird, and I'm sure I wasn't the only one that thought the same among my rather young audience. Once again, he sells this role, and he should be congratulated for it. Kudos go to the small, but effective supporting cast of the movie. Seeing Ciarán Hinds, Mr. Daily, earlier this year in TINKER TAYLOR SOLDIER SPY, I took notice of him, even if he didn't do much in that movie. Here he plays the only person willing to help Radcliffe's Kipp. Mr. Daily lost a son and has experienced much tragedy like Kipp. All of the other characters within this tiny village manage to decently play the superstitious and sometimes violent lot. I was also very impressed at the atmosphere of the movie. Everything was painted in very grey and muted tones. Even in nature, you rarely see anything that feels close to being alive. The fact that the main house where the movie takes places is surrounded by marshes and only a thin road to connect it to the out side world makes you feel as isolated as the character must feel. It feels like another world and that adds to the atmosphere and is once again, one of the best aspects of the movie. But what about the scares? There are some really good ones in here! I'm honestly surprised because I usually never even succumb to jump scares or scares in general. Tone and atmosphere are what freak me out the most. But, I have to admit, a little shamefully, that I jumped right along with my girly teenage audience. I literally got chills of fright that I only experience whenever I notice that 16 AND PREGNANT is actually a popular show. Some of them are a little cheap, I will admit, and they rely on a lot of audio work, such as a screech or a particularly dissonant tone being played in the score to help achieve the effect, but it works. What didn't work for me was the story itself and a real lack of tension. The plot and the initial task that Kipp is sent to do is a good enough reason for someone to go out to this remote village. The script doesn't handle the supernatural aspect of the movie and people's reaction to it very well. I don't want to spoil anything, but this raises up the question, just like with many haunted house movies, as to what the hell are people still doing there if they know something is wrong and haunted? At the very worst, the townspeople and those affected by their tragedy just come off as cartoony like any given mob from The Simpsons. My other problem with the movie was the fact that when you realize that the characters are never truly in danger. When the movie starts, you see that Kipp has three days to complete his assignment in the mansion. Every day he hears things up until the point where ghosts are starting to appear to him. The thing is...they don't do anything to him. They jump at him and startle him, but nothing else. By the time you realize that there was something that needs to be accomplished by Friday, too many jump scares have happened to give any weight to the plot or why you should even care about the task at hand. 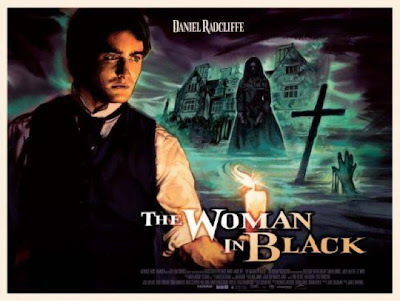 THE WOMAN IN BLACK is a worthwhile horror film. The movie has a great performance by Daniel Radcliffe that is hopefully the beginning of his separation from the Harry Potter moniker. There are some issues, but honestly, given that my expectations for horror movies released in January is pretty low, I can recommend this movie with confidence. It took me a while to really put my thoughts together about this movie, but if you have already seen THE GREY, then this is a good movie to watch this weekend.